Before I provide my Easter homily for Easter afternoon, I want to say one thing: I am very grateful for the opportunity to be surrounded by such a great community. The BU Catholic Center Community helps me to grow closer to Jesus. At the end of the Sacred Triduum, my heart is filled with gratitude for the opportunity to be the shepherd of this community. I love them. I really love them. And, I am grateful that they help me to follow Christ. Whatever I say that is helpful about being a disciple---it is only because Jesus has helped me by providing such great witnesses in my own life. I really love the people that Jesus has given me. So often--especially during this Lent--I meet people who, each in their own way, express their earnest desire to grow closer to God. "I want to be close to God, but I don't know how." Again and again, I people your age express a recognition that life without God is empty, that it leads nowhere. In so many conversations, people have expressed a hunger, a yearning for a deeper relationship with God. Our chapel is filled this morning. All of you are here because you have recognized in your life a desire, a need, for a deeper relationship with God. Some of you came here on Ash Wednesday and Lent with this desire. Perhaps you've lived Lent really well, growing closer to the Lord day by day. Or, maybe you started with big plans, but didn't quite make it. Some of you perhaps didn't just fall short on your Lenten intentions. Perhaps you made a complete mess of Lent. Maybe you feel further away from God than you did when you began Lent. No matter where you fall in the spectrum, you are here today. You are here because you want God. The Gospel on Easter Sunday afternoon is the Road to Emmaus. In this Gospel, Jesus provides four ways to help us to grow closer to Him. Firstly, each of the disciples had a desire. This desire is indispensable. They were taking life seriously. They were discussing serious things. In the face of Jesus' death, they wanted to understand reality. They were confronting the difficult questions about suffering, evil, and death. What is the meaning of it all? So often, in front of the bigger questions of life, it is easy to run away. Instead of being faithful to those questions that arise in the depths of our souls, we distract ourselves. We run away from these questions and live shallow lives. We throw ourselves into a million distractions in order to avoid being faithful to the desire in our hearts. We want to understand life, to know what the deeper meaning of reality is. We desire to understand God's plan for our life. And yet, to do this, we have to work at it. So often, we are unfaithful to this desire. But this desire is indispensable. The fact that you are all here today says that you have this desire. You desire a closeness with God. Secondly, the two disciples on the Road to Emmaus had each other. It is so important to have friends who help us to be faithful to this desire in our heart. It is so important to have companions on the road who help us to live life seriously. These two disciples were walking along and discussing all that had happened. Together, they were trying to comprehend reality. So often, I hear from students, "I used to have a great relationship with God, but then I came to college and none of my friends here go to church. All of my friends live a very hedonistic life. And so, it's really hard for me to stay close to God because God isn't important to my friends." Now, I'm sorry, but I've got something to tell you hat might be difficult to hear! But, I'm not telling you anything you don't already know. I'm just telling you what you've already realized. You need to surround yourself with friends who help you to grow closer to God. You need a companion on the road. I'm betting for some of you, that person is sitting right next to you in this chapel? Right? Maybe they coaxed you into coming to Mass today. They dragged you here. That's the person! Stay close to that person! A true friend helps us to encounter Jesus. A true friend isn't the person who helps us to escape from asking the serious questions and from living life with seriousness. The true friend is the one who helps us to grow closer to Christ. Those two disciples were helping each other to grow closer to God. Want to grow closer to God? Find friends who will help you. I've been at this Catholic thing for a good amount of years. And I'm a priest. Maybe you might think, "Ah, he's a priest. He doesn't know how hard it is." But I do. Left to myself, I can be totally shallow. I need friends who help me. I need friends who encourage me to pray. I need friends to help me to be faithful to that desire to be closer to Christ. There is a great Catholic community here at BU. Be a part of it! Thirdly, on the road, we are told that Jesus approached them and, after they told him what they were discussing, he began to explain the scriptures to them. In the Word of God, we come to understand the meaning of things. In His Word, God reveals not only His plan for the world, but also His plan for our life. When we listen to the Word of God, we learn how much God loves us, how much He desires us, and all that He has done for us. This is especially true when we hear the Word of God proclaimed at Mass. Also, there are Catholic bible studies all over this campus. Young men and women come together--like those two disciples on the Road to Emmaus--and they listen to the Word of God and they draw closer to Christ. If you want to grow closer to God, draw closer to the Word of God. Fourthly, one of my favorite lines in the Gospel is contained in today's Gospel. As evening draws close, Jesus acts as though he were leaving them, but the two disciples beg him to stay. "Remain with us!" they cry out. There is that desire! A common desire shared between them. They recognize that something is happening in them. Something great. And so they beg the Lord to stay. And then, when they sit down to eat, he blesses and breaks the bread and then their eyes are opened and they recognize the Lord. Then he vanishes from their sight. If we want to be close to the Lord, be close to the Eucharist. There is no way for us to be any closer to God than to receive Him in the Eucharist. The Eucharist is His Risen Body and Blood. If you want to be close to God, you need to be close to His Body, the Eucharist. You know this already. I'm not telling you something that you don't know already. I'm not speaking to you as an expert who is removed from the experience of needing Christ. I am one of you. I am telling you these things because they are true. We all need to desire God. We all need good friends who help us to pursue God. We all need to hear the voice of Christ in the Scriptures. We all need the Body of Christ, the Eucharist. I need these things. You need these things. You want a closer relationship with God. I know it is hard to believe, but He desires a relationship with you infinitely more. He loves you. He wants your happiness. He wants to give you everything that you desire and more. Without Him, life is empty. Without him, life is without meaning and purpose. Without Him, we try to escape into distractions, pleasures, and power. But, He is risen. Yes, He is truly Risen. It is almost One in the morning on Easter Sunday and I've just returned home from the Boston University Catholic Center post-Easter Vigil party, held in the apartment of some of our students. You might think it impossible to fit a hundred people into a room the size of a kitchen table, but Easter is the time of miracles. At the moment, I'm simultaneously wiped out and wound up. It was a magnificent few days. I am once again so impressed by the organization, commitment, and spiritual depth of our community. I share below the general idea of my homily for the Easter Vigil. Since I didn't write it out, this is just a sketch. At our Good Friday service last night, I was really moved as I watched all of you approaching the Crucifix and, one by one, kissing the wood of the Cross or kissing the feet of the Lord. I imagine that as you did so, you probably were trying to express some gratitude to Him, to thank Him for dying for you; to thank Him for loving you until the very end. It was beautiful to watch as you each spent a personal moment showing some tenderness towards Him. In making that gesture, we also felt how small it is in comparison to what He has done for us. The scriptures we heard tonight remind us of all that God has done for us. He created a world for us! He gave us life! He called Abraham and established a holy people. He rescued that holy people from slavery. He loved them and called them again and again to love Him in return. God gives us everything and He asks so very little from us in return. Even when it seems like He is asking for a lot--like when He asked Abraham to sacrifice his son--even then, we see that in return, God gives us so much more. Not only did God restore Abraham's son to him, but He also made Abraham the father of our faith and the father of many nations. God is never outdone in generosity. In the Gospel tonight, St. Luke tells us about these women who did something relatively small. They woke up early in the morning. Why? They wanted to anoint the body of the Lord. They felt His loss. They missed His face, His embrace, His voice . . . His presence. And so, they do the best that they can. They go to where His body is buried. There, they hope to anoint His body in order to slow down its decomposition. They want to keep His body for as long as they can. It's all that they have left of Him. Anointing His body is their way of clinging to him for a little bit longer. It's one small gesture of gratitude and affection for all that He had done for them. He had fed them, taught them to pray, healed them. He had loved them. Now, they were driven by an intuition that His body was the place to go in order to remain somewhat near to Him. 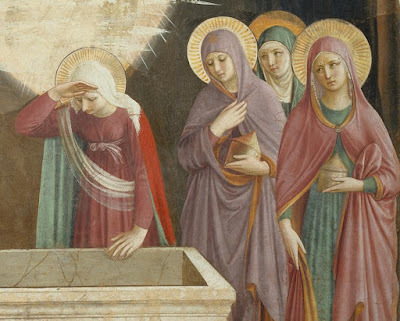 It was because of this affection for Christ--this tenderness towards His body--that these women were the first to experience the dawn of the new creation. It was because of their desire to be near His body that the light of the new order began first to shine on them. This new day of the resurrection continues to shine down through the ages to this very moment. It was evident to me yesterday, as you all kissed the feet of crucified Jesus. But it is also evident here tonight. In our front row are men and women who will be baptized, received into the Church, confirmed, and receive the Eucharist for the first time tonight. Somewhere along the way, you were given an intuition to go and search for the body of the Lord. You want to be close to the Lord and so you come to His body, the Church. St. Paul tells us that the Church is the Body of Christ. These men and women desire to join the Body of Christ. Or, for those of them who are already baptized, they are seeking to become more firmly united to His Body. For some of you, perhaps there were many obstacles along the way. Perhaps at times you felt like God was asking you for a lot. But tonight, no matter what you offer to God, He will not be outdone in generosity. In return, He will give you the forgiveness of all of your sins, the outpouring of the Holy Spirit, and communion in His Body and Blood. Tonight, you will receive eternal life. The Catechism of the Catholic Church refers to the Eucharist as, "an antidote for death." I am so happy that I get to give to you tonight, the antidote for death! Seek the Lord while He may be found. Call on Him while He is still near. Tonight, all of you come here because you wanted to be close to the Lord's Body. You are here late at night. You are at a LONG Mass. The Lord has given you the beautiful gift of faith. You want to be near His Body. When we love His body--both His mystical body, the Church and His Eucharistic Body--we are rewarded with far more than we could ever possibly comprehend. When we live our lives close to the Church and the Eucharist, God rewards us by giving us a share in His resurrection. We become partakers in the new creation. During these past days, like the women in tonight's Gospel, we have all attempted to draw closer to the Lord. We've stayed with Him in prayer on Holy Thursday. We've kissed His crucified feet. We have come here tonight to be close to His Body. In return for these small acts of tenderness, He gives the forgiveness of sin, the outpouring of the Holy Spirit, the new life of grace, and a share in His resurrected life. We give the little that we can. He receives us and gives to us more than we can ever imagine. Yes, He is Risen. He is Risen, Indeed. The first email I received today was at 4:30 in the morning. It was from a brother priest who simply asked, "Alb and stole or just stole?" He is one of several priests who will be helping me out tonight for our Holy Week confessions at Boston University and wanted to know what he should bring with him. I will bump into that priest later on this morning at the Chrism Mass, the Mass when all of the priests in the archdiocese gather with the Cardinal for the blessing of the Holy Oils. What really struck me though when I woke up is that this priest will have a busy and long day. He was sending emails at 4:30am and will be hearing confessions until about 9pm tonight. He and the other priests who will help me out tonight are all going out of their way and adding something additional to their already full Holy Week schedules. They do it because they're good priests and because hearing confessions--especially the confessions of college students--is such a great joy and privilege. Undoubtedly, by the time confessions end this evening, all of us will be exhausted. Hearing confessions is not just physically tiring. It brings with it almost a metaphysical exhaustion. While you are hearing confession after confession, you realize that you are being used in a way that is completely beyond your natural capacities. All of the sacraments receive their efficacy from the Cross of Christ. Thus, in the confessional, we are entering into the Mystery of the Cross. In some mysterious way, as a priest, you feel quite close to the Cross when you hear confessions. I think most priests would agree that after you've spent a substantial amount of time hearing confessions, you feel completely spent. But there is no greater feeling than that exhaustion. You feel as though you have given everything you have, but what was accomplished is way beyond what you gave. No matter how much the individual priest might give, none of that could bring about the forgiveness of sins. It's only because the priest is the instrument of the One who truly gave everything that the Sacrament brings about the obliteration of sin. In the confessional, we experience the fruits of Christ's total gift of self. Every confessional--be it in a Cathedral in Rome, in a college chapel, on the battlefield, in a hospital room, or in the case of St. Dismas, on a cross--every confessional is made from the wood of the Cross, stained in the Blood of Christ, and animated by the the breath of Christ which he breathed from the Cross. What happens in the confessional is so much greater than we ever truly grasp. In the confessional, we enter into the Mystery of the Cross. We stand beneath Christ and are washed in His Blood and our dead souls are resuscitated by his breath. Is it any wonder why priests who give themselves over generously to hearing confessions continue to do so time and time again? They know that they will be exhausted, but there is no place more life giving than in more perfectly uniting themselves to the Crucified Lord. I pray that tonight many young men and women will come to the Wood of the Cross. I also pray that Catholics everywhere will come to confession during this Holy Week and receive the Mercy of God. Jesus died for sins. We are not beyond His Mercy. We are not beyond His Grace. I know that sometimes people feel as though it is too late or they say, "I know eventually I will have to go." Don't put it off. He wants to forgive you NOW. He wants to free you NOW. 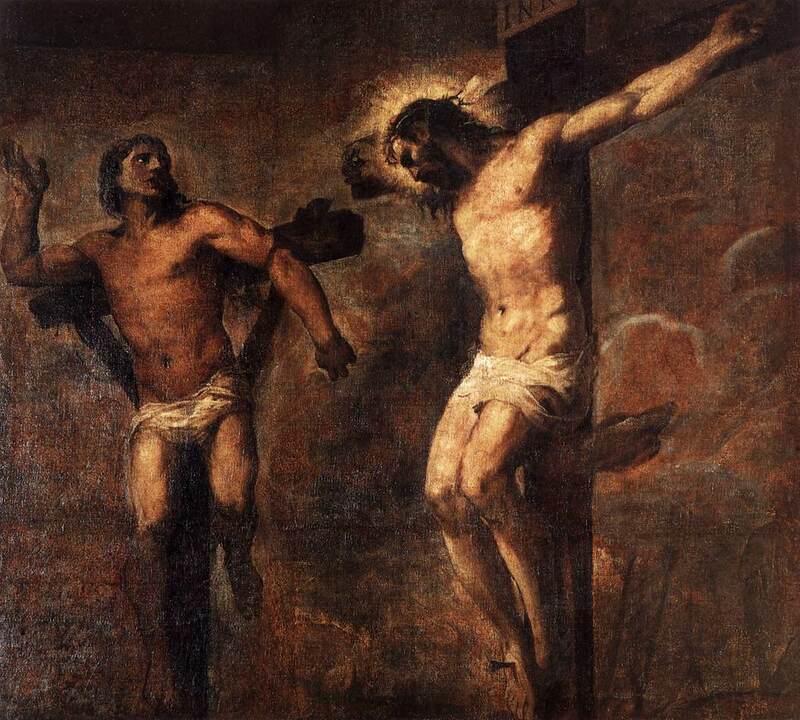 The Wood of the Cross was soaked and stained in the Blood of Christ. Every confessional is hewn from the Wood of the Cross. Every confessional is soaked and stained in the Blood of Christ. There is no sin that cannot be washed away by touching it to the Wood of the Cross. Come, receive forgiveness. In recent years, a phrase that has made its way around church circles is, "promoting a culture of vocations." The idea is that parishes (or, in my case, a Newman Center) ought to create a culture where priestly and religious vocations can flourish. I've been blessed in my priestly assignments to be in places where a culture of vocations exists. A culture of vocations is not a box to be checked off on a "to do" list of various activities in a parish. While various events, programs, and advertisements are well and good, they do not constitute a culture. I think you know that a culture of vocations has taken hold when it is no longer something mandated by the priest, but is rather something that is lived by everybody. Today is Palm Sunday. When I came down from our chapel this morning, there was a group of ten men from the BU Catholic Center gathered in our coffee room. They were all dressed in suits because they were heading off to St. John's Seminary for Mass and then brunch. What makes me really happy about this is that I had absolutely nothing to do with it. Our intern and the leaders of our Men's Group organized it with some of our alumni who are now seminarians. Some of these same men attend a weekly discernment group called "The Melchizedek Program." Again, I know about it, encourage it, and support it, but I am not the driving force behind it. This to me is evidence of a culture of vocations. When the women in our community visit religious communities, go on discernment retreats, and seriously help one another to discern whether God is calling them to the consecrated life, that is evidence of a culture of vocations. Quite regularly, the alumni of the BU Catholic Center who are now in the seminary meet up with current students from here. They continue to live the friendships that they made here. This to me is evidence of a culture of vocations. When I was a pastor, our rectory was often filled with young priests and seminarians. We would have cookouts in the garden or meals in the dining room. We'd just be sitting around in the morning time having a cup of coffee together. When people would stop by the rectory and see all of us together, laughing and having a great time, I could tell that they were genuinely happy to see our fraternity. This to me is evidence of a culture of vocations. Praying for vocations is central to building a culture of vocations. It was Jesus himself who told us that we should pray to the harvest master to send out laborers for the harvest. If Jesus has given us this clear command, we would be fools not to obey. At every Mass that I celebrate, I include a petition asking God to grant "an increase of vocations to the priesthood and to the religious life, especially from this community." Additionally, I frequently offer the "Mass for Priestly Vocations." In my previous parish, parishioners would offer their daily Holy Hour for particular seminarians and then write to those seminarians to encourage them. This was organized by the parishioners. This was evidence of a culture of vocations. Places that emphasize the centrality of the Sacraments are places where there is a culture of vocations. When people understand the importance of the Mass and see it offered with seriousness and with joy, their love for the priesthood grows. When people have a firm faith in the Sacrament of Penance and see its necessity, they recognize the need for priests. Where the Sacraments are emphasized, a culture of vocations flourishes. Where Eucharistic Adoration is present and promoted, a culture of vocations develops. Where priests, seminarians, and religious are present in the lives of people, a culture of vocations flourishes. The students at BU Catholic Center regularly encounter priests, seminarians, and religious. When priests and religious live their lives close to the people, a culture of vocations is cultivated. A culture of vocations exists when priests, seminarians, and religious are guests at the dinner tables of parishioners. A culture of vocations exists when priests, seminarians, and religious live a friendship with their people. Of course, one of the best promoters of a culture of vocations is to have vocations. Once vocations flourish in a particular place, they multiply. When I came to Boston University, a culture of vocations had already long been established here. It's not something that is imposed by dictate, something contrived, or something added on. It is a culture. It is something that is part of the life here. 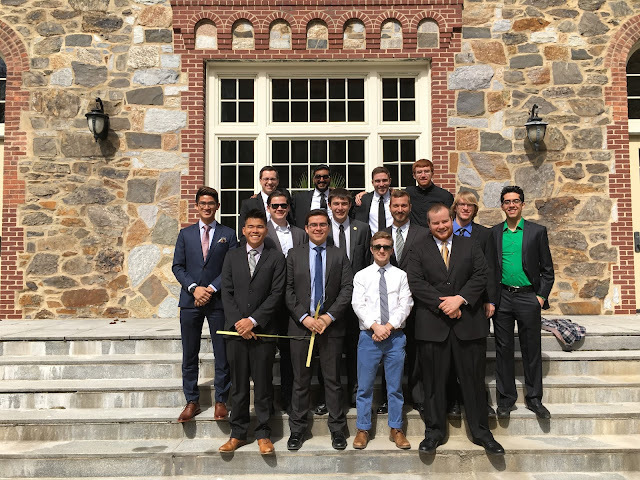 I hope that this makes you as happy as it makes me: Today, Palm Sunday, ten young men from BU organized themselves and went to the seminary in order to attend Mass and brunch with the seminary community. Included in that seminary community are four recent graduates from BU (two other recent grads study at a different seminary). That, to me, is what a culture of vocations looks like. I am very grateful to be a beneficiary of such a grace-filled culture.